The United States Mint recently started accepting orders for numismatic bags and rolls containing 2013 Fort McHenry National Monument and History Shrine Quarters. An array of products are available which include circulating quality coins struck at the United States Mint facilities located at Philadelphia, Denver, and San Francisco, bearing the “P”, “D”, and “S” mint marks respectively. The circulating quality quarters with the “S” mint mark are only available within numismatic products and not released for general circulation. The Fort McHenry Quarter is the third release of the year and the nineteenth release overall for the America the Beautiful Quarters Program. Launched in 2010, the program will highlight a national park or site from each state, territory, and the District of Columbia, with five releases annually. 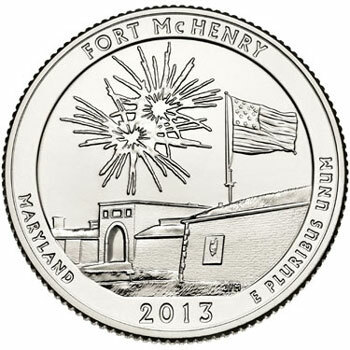 The reverse design for the latest release represents Fort McHenry National Monument and Historic Shrine during the annual “Defender’s Day” celebration. The fireworks symbolize the “rocket’s red glare,” linking the fort to its historic past. The reverse was designed and engraved by Joseph Menna. The obverse of the coin features the portrait of George Washington created by John Flanagan for the 1932 quarter. The Mint is offering 100-coin bags of circulating quality coins with the “P”, “D”, or “S” mint mark priced at $34.95 each. Two Roll Sets containing one roll each of coins with the “P” and “D” mint marks are priced at $32.95 per set. Three Roll Sets containing one roll of each mint mark available are priced at $46.95 per set. Single rolls of the “S” mint mark coins are available priced at $18.95. Each of the products comes in special numismatic wrapping that contains the name of the site, the state abbreviation, the face value of the contents, and the mint mark. The Mint has not established mintage or household ordering limits. The products will remain available for sale for one year from the original release date of August 26, 2013, or until inventory has been depleted prior to the one year mark.